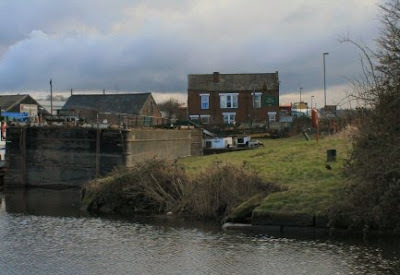 Leaving the mooring at Castleford one passes the Hargreaves yard and in the background can be seen The Griffin pub. Only slightly less stars than The Jolly Miller as we left at a respectable hour. The beer is good and the locals very friendly. What more could one ask for. Reaching the access to the crossroads with the river and weir to the left (it is not a good idea to go this way), Wakefield is straight on and Leeds to the right. Straight on for us this time as there are a series of locks out of use just the other side of Leeds that halts our progress in this direction. On the way out you pass one of the old waterways building that now look as though it could stand a bit of TLC. 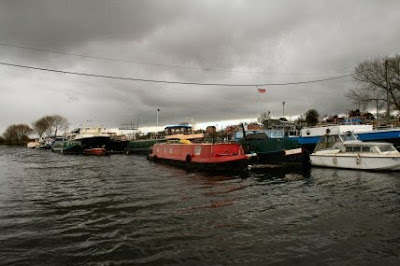 Soon we come across a boat yard with a number of interesting boats outlines. One or two look quite ancient. Just before the disused Fairies Hill lock is the unloading wharf for the ballast that has been passing us for days is dropped off. At this point there is a mud bar that reaches quite a way out into the river and I found it!! Here I am. Aground. Bugger. The bows would move. The stern would move but midships just sat there. Tim came alongside and found the bar as well but with bit of a shove he went back into the middle of the river. Passed a rope and he had to pull me till I was 90 degrees to the bank before I was free. 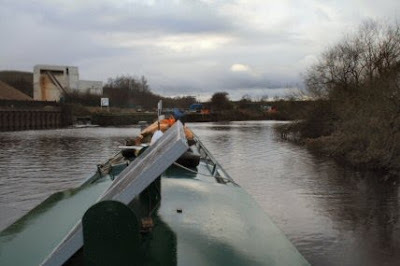 The mooring for the night is not far from the Stanley Ferry aqueduct. As you pass over the aqueduct there are signs that says " Do not obstruct the aqueduct or moor here". 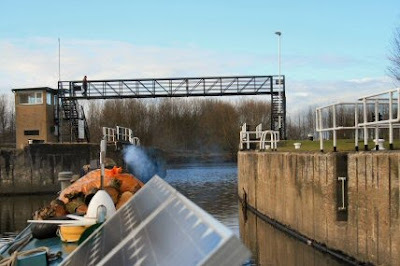 For some reason there is a widebeam moored right at the end and there is only a foot or so spare for a narrowboat. I guess you could use the new aqueduct but I had another boat coming through it and kept out of his way. Next to the aqueduct is The Stanley Ferry. A very popular eatery and with two meals for £6 I understand why. Italian chicken went down well. The local pub wasn't as friendly as some I have been in but the beer was Ok. 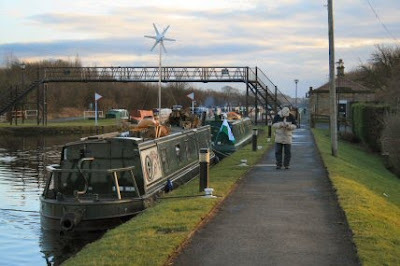 The mooring for the night is just below the Ramsden Footbridge which replaced the swingbridge which is still in situ but rarely used by the look at it. Tim is still trying to get his phone to work due to the glass being cracked and the message 'Insert SIM card' coming up all the time.